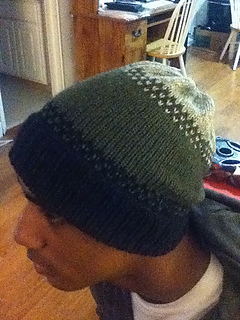 I designed and knit this hat especially for one of my favorite Missionaries, Elder Motes. It’s unseasonably cold this year and the Providence missionaries are outside in the wind and snow wearing flimsy store-bought acrylic hats. Not anymore. 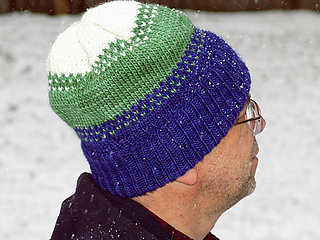 I designed this hat to use up partial balls of good quality yarn (making it budget and stash-diet friendly). I chose to use (and strongly recommend) Lang Jawoll Yak because it’s light, very warm, machine washable, and comes in a variety of conservative colors (which is important for a full-time missionary or any business professional). The construction is simple and the Color Transition band allows you to use colors that don’t typically play well together. The brim features lots and lots of ribbing so that it stays in place, fitting snugly to the head to keep the wind out, and is extra toasty over the ears when folded. 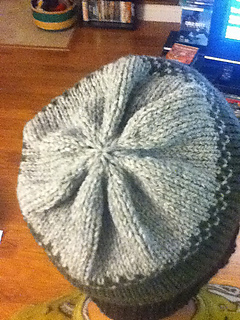 The rest of the hat is simple stockinette stitch with just a touch of colorwork to keep things interesting. The colorwork is provided in written instruction (no chart), and you could omit the colorwork if you so choose.